As we all enjoy the fine weather, walks along the boardwalk, and picnics at McCook Park, it is time to look ahead to fall planting time. The East Lyme Public Trust Foundation in co-operation with the East Lyme Parks and Recreation Department is again pleased to offer THE PROMISE of TOMORROW’S TREES-a project to raise funds for the support of the Niantic Bay Boardwalk and other projects of the Trust. This commemorative tree program makes available to the public, trees to be placed in public spaces in East Lyme. In 2015, 8 trees were sponsored at McCook Park and have sold out. In 2016, 5 dog-wood trees were sponsored at the Cliff Walk to McCook Point and have sold out. In 2017, we offered Phase III- Cherry Tree Lane- a walkway of five trees along the chain-link fence at McCook Park on Columbus Avenue. The trees, which are located between the side gate and the railroad tracks, are Kwanza Cherry Trees, a flowering, low growing species. 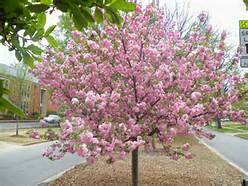 If you ever go to Washington, D.C. in the spring, you will see about 44 Kwanzan cherry trees around the Tidal Basin. Only two trees remain to be sold in that location; act fast to become part of beautifying that boundary line of McCook Park. However, McCook Park is not the only public space where people can choose to plant trees. If you are a former athlete, parent, or grandparent, perhaps, you will wish to commemorate the many games you participated in or viewed at Bridebrook Park. Sugar Maple trees are still available there to complete the line of trees along the outfield fence. If you have always entered the Boardwalk at Cini Park, perhaps, you will want to commemorate the pleasure of a walk by the Bay with a tree located in the Park. Only two Sycamores remain there. Members of the Samuel Smith House can commemorate the many volunteer hours they have spent at this historical house with a tree on the grounds. Book lovers can commemorate the satisfaction they have received from the many services of the Library by planting a tree at the Library Courtyard, and employees and citizens of the town can choose a commemorative tree at Town Hall. A contribution of $600 for a tree will cover the cost of the tree, planting, an 8”x4” plaque, a base, and a water bag to assist in the stabilization of the tree. Planting will take place this fall-2018. Since the East Lyme Public Trust Foundation is a non-profit 401c, contributions are tax deductible. June Hoye is the chairperson for the project in partnership with Dave Putnam, the Director of Parks and Recreation. Her committee includes Carol Marelli and Bill Rinoski-administration. They are also available at: East Lyme Town Hall-Town Clerk’s Office, East Lyme Parks and Rec., East Lyme Library, and the E.L. Book Barn. Support the East Lyme Public Trust and its PROMISE of TOMORROW’S TREES.